The award-winning Angel at Rose Hall in Eureka Springs, Arkansas is a 4-Diamond AAA rated Eureka Springs bed and breakfast located in the Historic District. A Christian B&B, the Angel at Rose Hall Wedding Chapel and Bed and Breakfast in Eureka Springs, Arkansas, is a magnificent recreation of an 1880's historic Victorian mansion. Built in 1999, the Angel at Rose Hall and staff strive to unite modern comforts with the gracious elegance of a bygone era while offering a devotion to Victorian refinements. Specializing in Eureka Springs weddings and wedding packages, receptions, honeymoons, romantic getaways, and anniversary packages, The Angel is the only Eureka Springs, Arkansas bed and breakfast to be awarded the coveted and prestigious 4-Diamond AAA rating and is considered to be " in a class of its own." Enjoy exceptional luxurious comforts in truly unique surroundings. Lovely amenities,and stately hand crafted furnishings assembled in a truly remarkable setting. Inside the main entry parlor elegant Victorian antiques and century-old stained glass windows await you. High above the lush green treetops on the upper floor of the mansion sits five elegant guest suites, each with their own unique charm and distinctive look. The Angel at Rose Hall Wedding Chapel and Bed & Breakfast in historic Eureka Springs is an upscale blend of Victorian elegance and warm hospitality. Our 5 spacious guest suites offer king-size beds, large 2-person Jacuzzi soaking tubs, fireplaces, balconies, and a host of amenities. 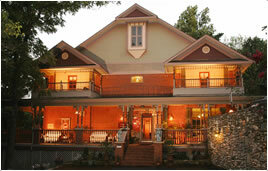 The Angel is the perfect place for your Eureka Springs wedding, vow renewal, romantic getaway, or special celebration. Nearby area attractions are: The Great Passion Play, horseback riding, museums, art galleries, fabulous shopping, walking trails, golf courses, two large lakes, white water sports, canoeing, biking, and great dining. We are only one hour south of Branson, Mo. Let us help you plan your Eureka Springs, "Extraordinary Escape" with one of our many vacation packages or wedding packages here in the "Wedding Capital of the South." Come and visit magical Eureka Springs, history explains, for hundreds of years Eureka Springs had been a refuge for rest and renewal. Native Indians referred to the Great Healing Spring nestled in the mountains of Arkansas as a place of renewal and physical healing. It is believed that the waters that flowed from the Basin Springs had magical and healing properties In the 1880's word spread and transformed this Arkansas wilderness into a bustling town. Eureka Springs' prestine mountain oasis became transformed into a destination full of visitors seeking a healing and rest. Today visitors come to Eureka Springs to renew their spirit and soul. Our quaint and charming historic downtown Eureka Springs village is filled with fabulous shops,art galleries, world class restaurants and more. Friendly and unique locals will make you feel like your a native. Our paradise awaits your visit. Angel at Rose Hall has once again received the prestigious: AAA 4 Diamond Award. Angel at Rose Hall has just been notified that the Angel at Rose Hall have been included in The Great Towns of America Guide Book in the section on Eureka Springs, Arkansas. GIFT CERTIFICATES make the perfect gift,call now ! Let us help you create a personalized gift, you can select any amount, length of stay or package,you decide. Surprise the one you love with a romantic trip to Eureka Springs. Let's us pamper you both. Love is always in the air at the Angel. Eagle Watch and Fall Foliage Tours on Beaver Lake. Expert guides with 25 years’ experience inform passengers about Bald Eagle’s features, habitat and help sight the eagles on a 1 hour and 15 minute cruise. Cruises will depart at 11:00 a.m. and 1:00 p.m. For more information contact Belle of the Ozarks at 479-253-6200 or by email at belleoftheozarks@ipa.net or visit www.estc.net/belle. 25th Annual Corvette Weekend. For more information call 417-862-7232 or visit www.eurekaspringscorvette.org. 68th Annual Original Ozark Folk Festival. Join us for the longest running Folk Festival in one location in the United States. Free music in Basin Spring Park (weather permitting), parade, contests, and performances in the Auditorium. 2nd Saturday Gallery Stroll. From April to December, on the second Saturday of each month (and every Saturday in May) the galleries open their doors from 6-9 p.m. with special shows and artist receptions. For more information visit www.artofeurekasprings.com. Writing Workshop at the Village Writing School every 2nd and 4th Saturdays of the month. For more information visit www.villagewritingschool.com. Poetluck is a potluck dinner and literary salon held the third Thursday of every month, year around at the Writers’ Colony at Dairy Hollow in Eureka Springs. Poetluck starts at 6:30 pm. For more information call Linda Caldwell at 479-253-7444. Great Ozarkan Beard Off. This yearly event helps raise awareness and funds for mens prostate health and the Arkansas Prostate Cancer Foundation. For more information on events visit www.goboeurekasprings.com. Eureka Springs Art Bazaar at the Inn of the Ozarks Convention Center. 10am-5pm. Admission is two non perishable food items or $3. All proceeds benefit Flint Street Food Pantry. Hourly door prizes, entertainment, supervised kids area, free 'make your own' wrapping paper, and more! Annual Eurekasprings.com Christmas Festival presented by Eureka Springs Downtown Network. For more information visit www.eurekaspringsdowntown.com. Eureka Springs Christmas Forest. The formal garden area atop Crescent Mountain will be illuminated with more than two-dozen Christmas trees decorated by local charities as a fundraiser for each. Visitors can stroll throughout the grounds and choose which one they think is best! Admission is free. For more information go to www.crescenthotel.com. Winterfest Fine Art & Craft Show/ Sale at the Best Western Inn of the Ozarks Convention Center from 9am-6pm. This event helps support art and artists of Eureka Springs. Admission is by a donation of two food items or $3.00 to the Flint Street Food Bank. Christmas Forest Tree Lighting Ceremony at the Crescent Hotel on the East Lawn. Beginning at 6pm. Voting is all month long. Candlelight Tour of Homes. Tour Eureka’s Victorian homes presented by the Preservation Society. For more information visit www.eurekaspringspreservationsociety.org. 13th Annual John Two Hawks Christmas Concert at the Auditorium. For more information call 479-253-5826 or visit www.johntwohawks.com. 15th Annual Christmas at the 1886 Crescent Hotel. Arriving at the doorstep of this delightfully decorated 5 Historic Hotel of America. Guests are swept in by the jubilant breeze of Christmas. For more information visit www.crescent-hotel.com/christmas.htm. Charles Dickens “A Christmas Carol”. A fully costumed Victorian-parlor style dramatic reading of the most beloved Christmas story of all, paired with a four course dinner. Starts at 6pm. Reservations recommended 479-253-9652. Ozarks Chorale Christmas Concert at the Auditorium. For more information visit www.theozarkschorale.org. watering meals and exotic specialties in settings from a rooftop oasis to a Moroccan palace. Arkansas North by Northwest - A glittering gem of northwest Arkansas, Beaver Lake’s 28,000 acres of clear water attract thousands of water sport lovers, fishermen, hikers and birdwatchers. The lake is surrounded by forests, tall bluffs and meadows crisscrossed by hiking trails. Campgrounds, resorts, marinas, outfitters, restaurants and shops serve the lake area, which is located in the Ozark Highlands near Rogers, Eureka Springs, Springdale and Fayetteville. Trout fishing on the White River is popular below Beaver Dam. Rogers has a variety of retail stores in its historic downtown district that covers eight square blocks. Brick-paved streets lead to old-fashioned storefronts filled with unique furniture, antiques and gifts, to cafes, and to the Daisy International Air Museum and the Rogers Historical Museum. Springdale is the place to catch a ride on the Arkansas and Missouri Railroad in a beautifully restored turn-of-the-century passenger car. Its downtown is also home to the Shiloh Museum, which offers Ozark history and buildings dating back to the 1850s. The Fayetteville square is known for its colorful gardens, unique shops, and Farmer’s Market that runs three days a week beginning in spring. Just blocks away, Dickson Street is the hip place for shopping, dining locales and tons of live music venues. Completing the scene are symphony concerts and dance and theatrical performances at the Walton Arts Center. For more information on Rogers or phone 479-636-1240. For more information on Springdale visit or phone 479-872-2222. For more information on Fayetteville visit or phone 800-766-4626. Eureka Springs – Haunted hotels, great food, unique shops, natural springs and homes built on the sides of rock cliffs make up this picturesque town. Nestled in the Ozark Mountains, Eureka Springs’ entire downtown area is on the National Register of Historic Places. It’s packed with attractions such as gardens, caves, an exotic wildlife ranch, live music, and train excursion rides. Unique boutiques offer everything under the sun – antiques, fine art, contemporary and vintage clothing, handmade crafts, fine art and more.Eureka Springs has been named one of America’s Dozen Distinctive Destinations by the National Trust for Historic Preservation. ARKANSAS Angel at Rose Hall , AAA Four Diamond Bed & Breakfast, Eureka Springs Built in 1999, the B&B provides modern comforts coupled with a Victorian design and furnishings. Spacious rooms include two-person Jacuzzi tubs, and most rooms have balconies. Thousands of weddings have been performed at this romantic getaway, with many newlyweds returning to celebrate their anniversary. Romantic amenities include a one-hour massage for two, chocolate-covered strawberries, chilled sparkling beverages, floral arrangements and carriage rides. Eureka Springs, Arkansas is an absolute must-see for your vacation plans. Arriving in Eureka Springs you are met with a magical ambiance that draws you in and gives you a sense of peaceful charm. There is something magical and magnetic in the air. One trip is never enough which brings visitors back time and time again. High a top the highest mountain in Eureka Springs is the Crescent Hotel. Built in 1886, The Crescent has been a hotel, a hospital, and a boarding school for young ladies.Yes, it is haunted,ghost tours conducted each night at 8:00pm.Meet in the lobby. Located just behind The Crescent Hotel is St. Elizabeth's Catholic Church. Visitors may reach the church via a flight of stairs that leads from the hotel garden to St. Elizabeth's. According to Ripley, this is the only church in the world that is entered through the bell tower - believe it or not! Tour the many springs of Eureka Springs. The Crescent Springs and gazebo is located at the intersection of Hillside Ave and Springs Street. Walk south and visit Harding Springs, Sweet Springs and at the south end of town Basin Park Springs. Visit during the season in and enjoy afternoon music featuring local talents. Keels Creek Winery open from 12 noon to 5PM offers a wonderful array of locally made wines. Enjoy the tasting as well as their gallery of local art work. Little Golden Gate Bridge, take a short road trip to Beaver Town over the White River. The bridge looks like a mini Golden Gate. Contact Smith at Rogues Castle at Beavertown for a Tour and narrative history of the property. One of my most favorite places in Eureka Springs the St. Elizabeth’s Catholic Church, enter the church through the bell tower, to experience the spiritual vortex. How about Lion's, Tigers and Bears? Visit the Turpentine Creek-- open daily 9-4PM If this is your first time, visit during afternoon feeding. Beans and Corn Bread for lunch? Visit a working grist mill on the War Eagle River, a few minutes outside of town, War Eagle Mill. Finally what would a trip to Eureka Springs be with out a horse and carriage ride? To make your trip complete call Tom at Olden Days Carriage Rides. Take a romantic carriage ride through the historic district of downtown Eureka Springs. If it is chilly Tom has heated blankets on board.The Angel at Rose Hall is centrally located in the heart of the historic district, it is your Eureka Springs vacation destination. The Angel at Rose Hall is the perfect venue for your destination wedding, if you have decide on selecting a Eureka Springs Wedding Venue or Eureka Springs Wedding Chapel. Since the Angel open less than 11 years ago, we here have been dedicated to the many Brides that we have helped with their special day. Many of our Brides are searching for the perfect wedding package and venue. A package that offers an elegant back drop for their event, a honeymoon stay and amenities. Many Bride not only see the Wedding as this exciting event, but also a mini vacation or family reunion. Eureka Springs and surrounding areas have so much to offer we generally suggest to Brides, spend an extra day enjoying the site of Eureka Springs. Since of very talented staff handles all the details, enjoy your stress free visit with us. Contact the Angel at Rose Hall for further information. Angel at Rose Hall Arkansas's only AAA Four Diamond Bed and Breakfast.. Deciding to hold your wedding in Arkansas, might to a great solution to finding a location in the middle of the country. Angel at Rose Hall is the perfect place to host your Eureka Springs, Arkansas wedding location. The Angel at Rose Hall has been the site of well over 2500 weddings and receptions. Many Brides slect our popular "Somewhere in Time " Wedding Packages. Many families and guest have the pleasure to arrive in advance of the wedding day and enjoy Eureka Springs and the many activies the area has to offer. What a great oppotunity to enjoy your famliy wedding and a family reunion / vacation. Contact the Angel at Rose Hall an Eureka Springs Weddings Chapel we would be happy to help you plan your special day and help with your wedding needs. The Angel at Rose Hall is the only 4 Diamond AAA rated Bed and Breakfast in the State of Arkansas.We are housed in the charming Eureka Springs historic district. Visit Eureka Springs this Weekend, the Annual Eureka Springs Mardi Gras Parade is set to begin at 2:00 pm.Come and watch Eureka Springs explodes with excitement and fun! Mardi Gras is celebrated each year, before the beginning of the Lenten season on Fat Tuesday, just before ash Wednesday, 40 days before Easter. Eureka Spring's Mardi Gras has garnered the attention of many and this years event proved to be bigger than last years. Keep you eyes open for the"Taste of New Orleans Day" Cafe au Lait and Beignets. Joe David Rice of Arkansas’s Tourism was selected as the new Eureka Gras Mardi Gras Grand Marshal. The 6th Annual parade is set to roll into town on March 5,2011@2:00pm. Following the parade is the Annual Mardi Gras Krazo Kostume Kontest, to be held at New Delhi Cafe Bandstand on Main Street. Check out the New Delhi at 3:30PM Cash & Gift prizes for best costumes. Free Admission!! The Annual Hookers and Joker Ball is set for March 3 and will ends on Mar. 8 at the " St. ‘Lizbeth’s King Cake Ball and Mardi Gras Dinner" at 6 p.m. Mardi Gras Beaux Arts Ball on March 5, 2011at the Basin Park Hotel-Barefoot Ballroom call (479) 981-9551 for more information. Eureka Gras Mardi Gras Extravaganza 479-981-9551.The Angel at Rose Hall, your Eureka Springs Bed and Breakfast and Eureka Springs Wedding Chapel is just a short trip from the beginning of the parade route. Spend the weekend with us and walk to the parade. Plan to spend the evening at the Ball and Dinner. See you there. So "let the good times roll." Laissez les bon temps rouler! Warm up after the Victorian Classic races this Saturday, March 12, with a hot bowl of soup at The Eureka Springs Historical Museum’s annual SOUPER SOUP. Serving hours are 10:00 a.m. to 1:00 p.m. at the Eureka Springs High School cafeteria on Highway 62 West. A variety of delicious soups, provided by the some of the city’s finest restaurants, will be available. Along with two bowls of soup, you also get cornbread, a beverage and a choice of a delectable desert from a selection prepared by local Bed & Breakfast establishments. All of this for only $6.00 for adults, $3.00 for children under 12 years of age.Join us for a tasty bowl of soup, vote for your favorite one and help us preserve your history. This event is one of the major fundraisers that the Museum depends on for its operating expenses.Tickets are available at the Museum at 95 S. Main St., the Chamber of Commerce office, Zarks Gallery and from any Museum board member or at the door. For more information contact the Museum Director, Ginni Miller, at 479/253-9417 or eshm999. @sbcglobal.net This is a great opportunity to have fun and support your community as well. The Angel at Rose Hall your Eureka Springs Bed and Breakfast and Eureka Springs Wedding Chapel. is just a short trip from the starting line of the race. Plan a visit this weekend. After watching the lastest news updates on the crisis in Japan I can not help but think about how gratiteful I am for all that I have. Gratitude for some is a ways of giving thanks. For Jesus gratitude was his true greatness. Some have journals in which they write words of gratitude Journals created for writing words of gratitude have become a popular idea for reflecting on ways of giving thanks, blessings, and praise. I created my own journal writting at the beginning of each year words of blessings and thanks. Sarah Ban Breathnach author of Simple Abundance, increased our awareness of the need to give thanks and to recognize those simple pleasures in our world that provides simple means of gratitude. Create your own world of gratitude by saying "thank you" .Count your blessings, and praise God. For by spreading blessings to others we are blessed. To express gratitude to that special someone in your live, visit Angel at Rose Hall your Eureka Springs vacation destination. A Eureka Springs Bed and Breakfast and Eureka Springs Wedding Chapel. A three-day multisport festival consisting of a sprint-distance triathlon on Friday afternoon, road bike tour rides and racing on Saturday morning and running races on Sunday. The name not only will be the moniker which the festival eventually will be known as, but also refers to participants who complete the ultimate challenge! Any participant who can complete the triathlon, 100 mile ride and 10K run will be known as "The Eurekan"! The finish line for all events is the same place each day. The finish line is located in the heart of the city on historic Main Street in front of the Eureka Springs City Courthouse. Sounds like another great reason to visit Eurkea Springs. We here at the Angel at Rose Hall, your Eureka Springs Bed and Breakfast and Eureka Springs Wedding Chapel are just a short jog to the center of town. Enter the race or watch by the side lines. On Saturaday April 2,2011at 2:00pm. at Hobbs State Park a Conservation Area visitor center on Hwy 12 just east of the Hwy 12/War Eagle Road intersection at presentation by University of Arkansas professor of journalism and accomplished documentary film maker, Larry Foley, will share his latest work “Bridge to War Eagle” at the Hobbs State Park – Conservation Area visitor center this coming weekend. Foley’s productions have earned many regional, national and international awards, including two Emmys from the National Academy of Television Arts and Sciences, and six Emmy nominations. Written and produced by the Emmy Award winning team Larry Foley and Dale Carpenter, the film captures one of the most representative images of Arkansas, and ties together local history. According to Rachel Diersen, interpreter at Hobbs State Park, “A great film for locals and visitors alike”. The film also features Fort Smith Artist John Bell Jr. and the work of art that John Bell created of the War Eagle Bridge and mill. What great fun and educational as well. Hobbs State park is a short trip from Eureka Springs your extraordinary escape and the Angel at Rose Hall, your Eureka Springs Bed and Breakfast and 4 Diamond AAA rate Bed and Breakfast and Eureka Springs Wedding Chapel. A short walk from historic Eureka Springs. Dear Lord, bless and enlarge my territory, so that Your hand will be with me, keep me from evil, so that I may not cause pain. The Prayer is the Prayer of Jabaz a guest spoke to me this morning about it's importance in her living walk with God, I love it , and felt the need to share it all of you. Adventure Subaru and Progressive Trail Design again are proud to present the 2011 Eureka Springs Fat Tire Festival, July 15th-17th. This year again promises to be bigger and better than ever. The 2011 Fatty Fest has officially been coined “The Year of the Kid”. We will be hosting a massive ”Kids Bike Rodeo”. On the slate of activities are skills courses and clinics, barrel races, games, water feature, food, fun, sun and more. Again we will kick things off with the “Phat Tire Bike Shop Short Track” at Achord’s MX track. The new improved course will host all the CAT races plus the Kid’s Race, Costume Single Speed Crit, and team relay. Last year’s races provided the most memorable moments of 2010 “fatness” and this year. If you are planning at trip to Eureka Springs this weekend you are in for a treat, the annual Bluegrass Festival is set for this weekend. This is a free event that is open to the public. The festival opened this Thursday with the watermelon eating contest. All contestants are a asked to meet at the Basin Springs Park. The festival follows with musical events at Basin Springs Park and the Auditorium. Spring is here, well almost. I am guessing Eureka Springs is not the only place in the southern central states that is experiencing usually warm winter weather. Well, what am I talking about what "Winter" weather? Today I saw my first glimpse of spring, yellow daffodils, jonquils and crocus. They were incredible. Bright yellow and purple, just the most perfect shade of springs. I cannot help but wonder will be have a spring or just an early summer. Since Eureka Springs residence love to plant their flower garden what better of a place to plan a spring trip. There are so many things to do, visit a unique lady's clothing shop, or stroll into an Art Gallery,or maybe walk thru our own Victorian streets, filled with painted ladies and spring gardens. For the adventure seeker, there are many canoe and rafting outfitter who can help you spend your days, seeing the White and the Kings Rivers. Soon the Belle of the Ozark will reopen and sail Beaver Lake and her endless shoreline. Or maybe it a cave or cavern you would like to climb and crawl through, don't forget Lake Leatherwood, America largest City Park and if you still have the energy, plan a hike just here in town, you can truly spent the entire day just walking and capturing Eureka Springs,just like a native. The widget AX3D77VQX1 powered by Feed Informer does not exist.